I do love Halloween, it's such a creative time of year and lets not forget a time where you can acceptably walk around in public looking scary as hell! Over the past few years I've entered the lookbook.nu halloween costume contest. It's such a fun competition where you can really let your creative juices flow and I just love looking at what everyone else has come up with! So here is my entry for this year. This look was inspired by an editorial in Ever magazine by Pauline Darley. I just adore the way in which she combines high fashion with something so creepy and dark in such a minimal way. I really wanted to emulate this in my look. Whilst I was browsing online I came across this amazing skeleton beaded bodysuit on Missguided for the bargain price of £9 I just had to get it! I didn't really want to put anything else with this bodysuit as it looked so brilliant on its own and everything else just distracted from it, so I threw on a pair of tights and that was the clothing part of my costume done. The whole thing that really brings this look together is definitely the makeup. 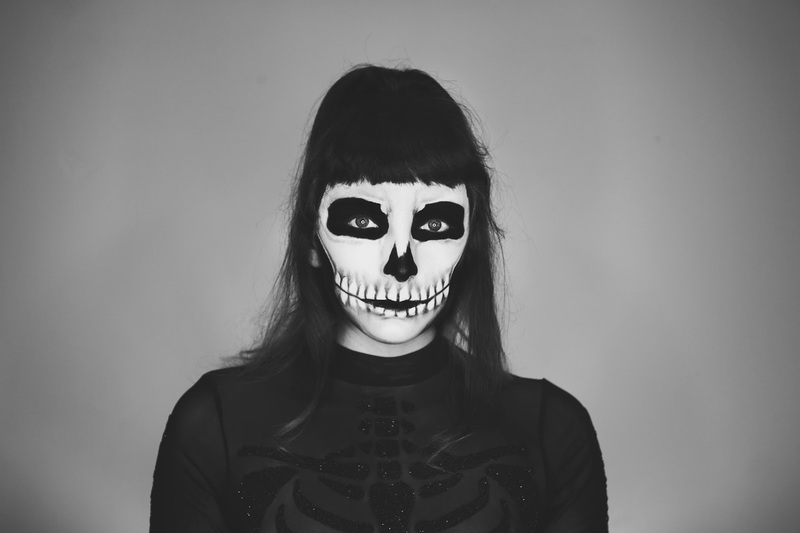 To create the skeleton face and hands I used Freedom Makeup's SFX ghost stories palette, it was so helpful as it pretty much had everything I needed to create this look. I then used MUA Luxe voluminous felt liner to add in the finer details. It took me about an hour and a half to create this make up look as it was all about building up the layers and blending, it's not as hard as it looks though so it's definitely worth a try! I had so much fun doing this look, I hope you all like it and I can't wait to see what everyone else comes up with this year!